Mmmmm! 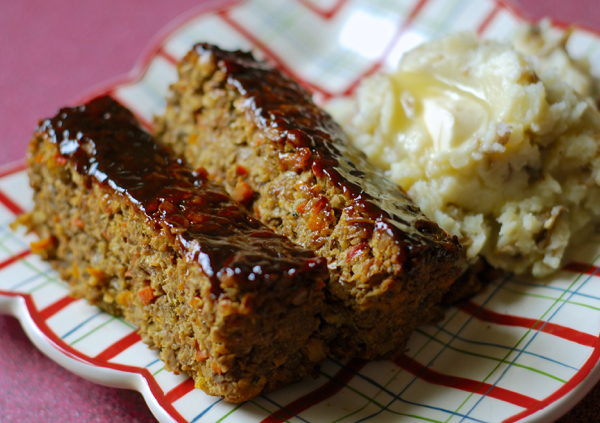 I used to love meatloaf, and now that I’m eating a plant-based, vegan diet I love this lentil loaf even more. So much flavor, and none of the nasty cholesterol and hormones that you get when you eat animal products. The maple BBQ glaze on top is amazing! Serve this up with a simple salad and your favorite, creamy mashed potatoes & gravy! Combine the flax meal and the soy sauce. Set aside to thicken. Heat the 2 Tablespoons olive oil in a large skillet. Once hot, saute the onion, bell pepper, carrot, and celery until tender. Add the garlic. Saute an additional 30 seconds. Remove from heat. Cool a bit. In a blender or food processor, process 3/4 of the lentils. Leave the rest whole. Once the flax mixture has thickened and the veggies are cool, place everything in a large mixing bowl. Using hands, mix until everything is evenly combined. If it seems too dry, add a little water or veggie stock. If it seems too wet, add a little more flour. Oil a loaf pan and press the mixture into it. Top with the following glaze. Whisk all in ramekin and spread over lentil loaf. Bake in preheated oven, uncovered, for 45 to 50 minutes or until set and hot all the way through.